Domino’s Pizza Rolex « Gluttoner: You gonna eat that? 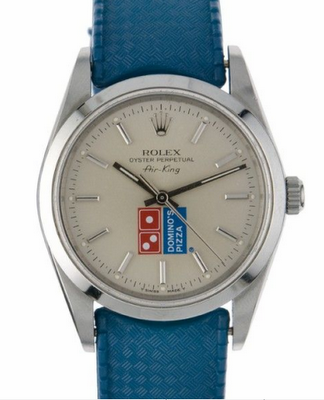 Totally baller Domino’s Pizza Rolex watch. Cheesier than a box of cheesy bread on top of a deep dish with extra cheese. These were given out as performance incentives to higher level Domino’s employees in the 90’s who then probably stashed it away in a box forever because who would actually wear this luxury bastardization? Stay classy Domino’s.